Being Creative with what’s on hand is what cooking is to me. 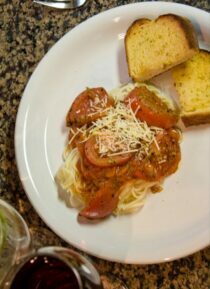 In this post, I share one of my favorite tomato sauce recipes. It’s a way of living I grew up with that somewhere between college and having kids I put on the back burner. I’m talking about using what is in your home pantry and not planning the meal around making a trip to the grocery store. In today’s recipe I use ingredients I always have in my kitchen or in the home garden. Below is a favorite of mine to cook up most anytime for my family to enjoy. You can use a jar from your pantry or cook down tomatoes from your garden to make this tasty sauce. Serve over pasta, baked veggies or use it as the base for soup. You can 'cheat' and use store bought pasta sauce just omit the extra spices. In large skillet fry up hamburger or sausage and garlic. After meat is cooked place in drainer. In the same hot skillet saute onions. Add mushrooms, tomatoes and carrots after about 5 minutes of saute onion process. 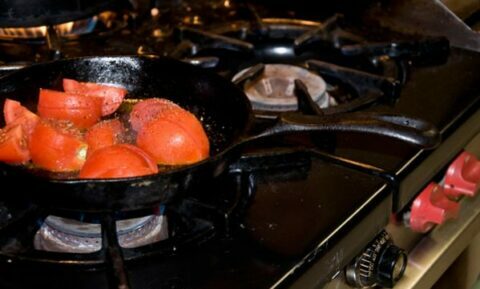 Once the veggies in skillet are some what soft ( about 10 minutes of sauteing ) add the meat back to the skillet. Slowly add the sauce and mix in spices. Cook for about 15 minutes - stirring occasionally. Serve when hot over favorite pasta or veggies. Continue to cook the hamburger and veggie mix for about 5 minutes before slowly adding the tomato sauce. Be creative – you can add or admit whatever veggies you have on hand for this sauce. Below are some of my favorite photos while make this meal. I’d love to hear how you get creative with what you have on hand. Be sure to send me a message on my contact page featured on this website. You can also connect with me on social media below. For us it is always what ever veggie we have over pasta. Your pictures above look very familiar! Favorite would be homemade tomato sauce. THank you for sharing! I love all the things you can make from tomato sauce. I’m heading over to check out your blog now because I love your way of thinking. Wonderful post Bren on both Michael and Jan, what they bring to the world of gardening. Your creating menus from your pantry will be inspiring a book in it’s self I’d say. LOVE IT…I’m always a fan of Cupboard Cooking (as I call it, anyway). My fave has to be any sort of pasta with anything in my veggie drawer. Lovely post Bren. and quite right too. By planning a meal round a shopping trip we end up spending too much on unnecessary stuff. your tomatoes look so good it’s made me hungry. 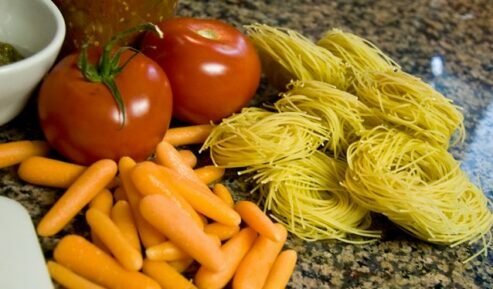 Also I love pasta and that recipe sounds great….good for me as a vegetarian! I totally agree with you on using what you have on hand. Your sauce looked fabulous. I had made a commitment this year to use what I have making art projects. I have so much stuff and yet I continued to buy more. I’m doing really good so far this year. The only thing I have bought is replacement paint.